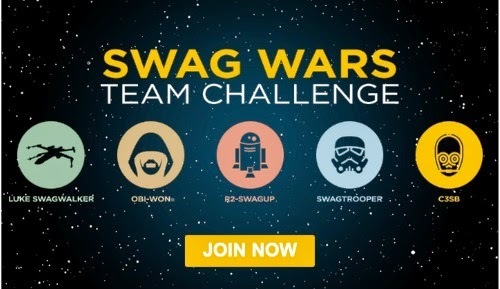 Swagbucks has a Swag Wars Team Challenge on now! Earn points for your team in the categories below and help your team become the true Guardians of the Swagiverse. • Surveys - Contribute 25 points to your team when you earn SB through Surveys. This includes SB earned through Completions, DQs and Over Quotas! • Search - Contribute 20 points points to your team when you earn SB through Swagbucks Search. Make sure you default your search engine to Swagbucks and you’ll never miss a search win again! • SwagButton (Browser Extension) - Contribute 20 points to your team when you earn your 1SB for being logged into the SwagButton. Don’t have the SwagButton? Get it today! • Mobile Video - Contribute 15 points to your team when you earn SB through the Swagbucks Mobile Video App. Don’t have the mobile video app? Get it here! • Referrals - Contribute 15 points to your team when you have a new member sign up! Start referring now! • Swagstakes - Contribute 10 points to your team when you redeem your SB for a Swagstakes Entry. The Swag War Team Challenge ends at 12pm PT/3pm ET on May 8 . All bonuses to be awarded on May 8. Want to join the Team Challenge? Click on the image near the top left on the Swagbucks homepage, you will be randomly added to one. Good luck! Not a Swagbucks member yet? Join here!